On November 11, 1813, American forces were defeated by smaller numbers of British forces at the Battle of Chrysler Farm 100 miles from Montreal. A force of eight hundred British and Canadian troops led by Lieutenant Colonel Joseph W. Morrison met the American advances into Canada. American Brigadier General Boyd was dispatched with 2,000 men to handle Morrison's threat. On the evening of November 10, Morrison placed his headquarters at a farmhouse of John Chrysler on the north bank of the St Lawrence. The St. Lawrence on one side and swamps on the other secured his lines. The American forces had no choice but to attack the British line directly. 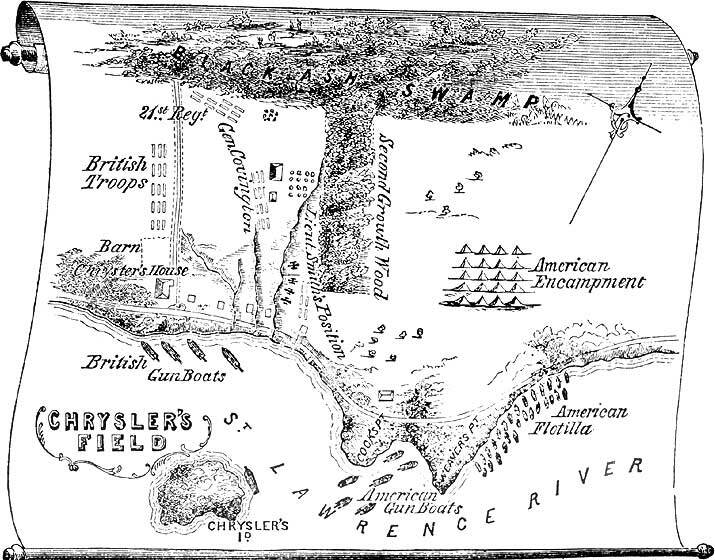 The British held their position and did not fire until the Americas were close. They then opened fire with devastating effect. The American line broke and the assault was over. It was a humiliating defeat for the Americans. The British lost 22 killed and 148 wounded; the Americans 102 killed and 237 wounded.